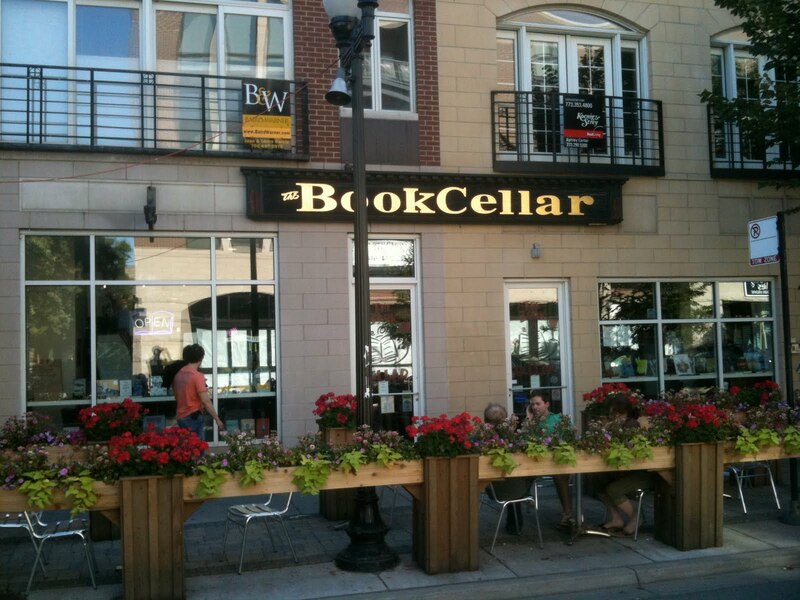 On Monday, June 30th, Laydeez do Comics Chicago held a pop-up event at Book Cellar in Lincoln Square. It was meant to coincide with, and help celebrate, the fifth birthday of Laydeez do Comics! Despite a rain storm of near apocalyptic proportion, the Chicago event was a great success. Our speakers were Cathy Hannah and MK Czerwiec. 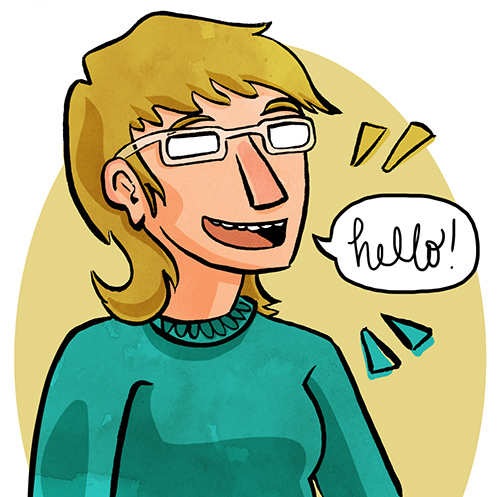 Cathy Hannah is a self-published comic book artist and art historian. 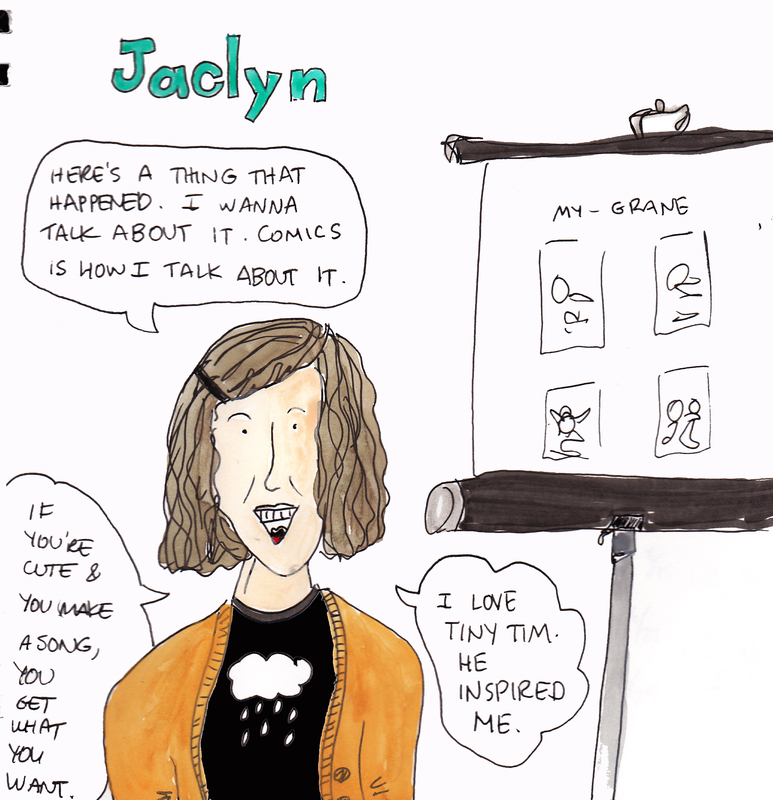 Cathy discussed her early art influences, her comic process, and her book Winter Beard. 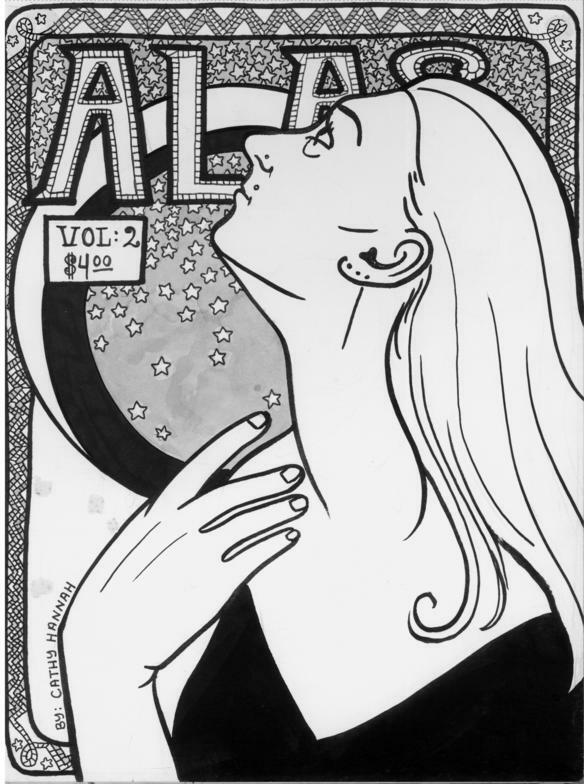 Cathy also showed images from and described her current project, Alas, a zine in which she is pursuing several fascinating story lines and often designs elaborate covers that reference historic eras of art. Hannah closed with this image in honor of Laydeez. MK Czerwiec (pronounced sir-wick) is a nurse and comic artist. She discussed exemplary recent graphic novels that explore the intersection of comics and medicine, otherwise known as Graphic Medicine. 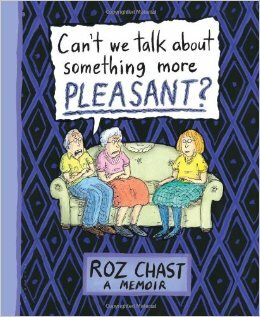 Specifically discussed was Roz Chast’s new book, Can’t We Talk About Something More Pleasant. MK also discussed her own comic art, comics “origin story” and current project, a graphic memoir of being an AIDS caregiver during the 1990’s. 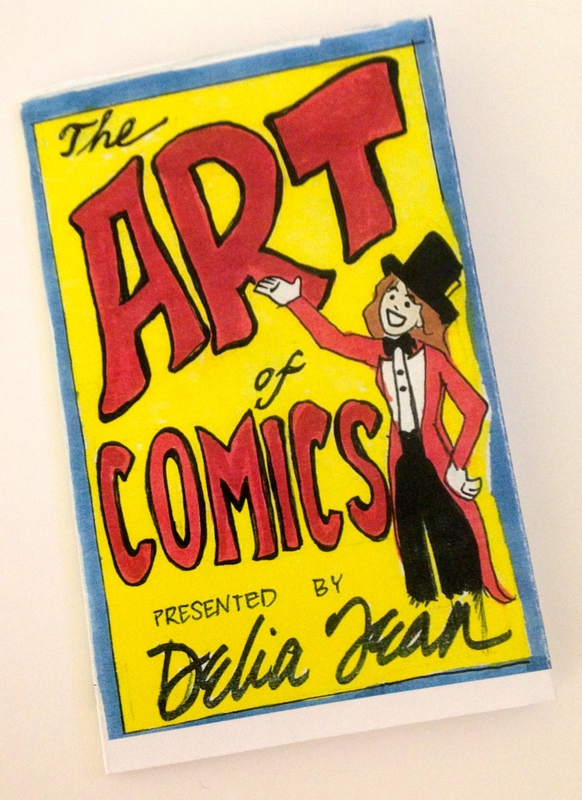 An added surprise of the evening was audience member Delia Jean, newly returned Chicagoan, who created and brought an eight fold comic that she made just to share with Laydeez. Thanks, Delia! The screening was followed by a fantastic intergenerational, informal discussion. Thanks to all who came and participated. What a great way to wrap up Laydeez do Comics’ first Chicago year. Looking forward to more great meetings in 2014. Stay tuned for details. Our October 2013 meeting took place on Halloween! There were costumes, candy, and COMICS! Guest blogger this month is Laydeez organizer MK, aka Comic Nurse. Our first speaker was Beth Hetland. Her bio: Beth Hetland was raised in the rolling hills of Wisconsin. After earning her BFA from The School of the Art Institute of Chicago in 2009, where she started making comics, she packed up and moved to White River Junction, VT to attend a graduate program at The Center for Cartoon Studies. She graduated with an MFA in 2011 and accepted a position teaching comics at her alma mater, The School of the Art Institute of Chicago. She has been teaching there ever since, bringing comics and cheer to eager young minds. She has been self-publishing since 2006 with over 50 titles to her name. 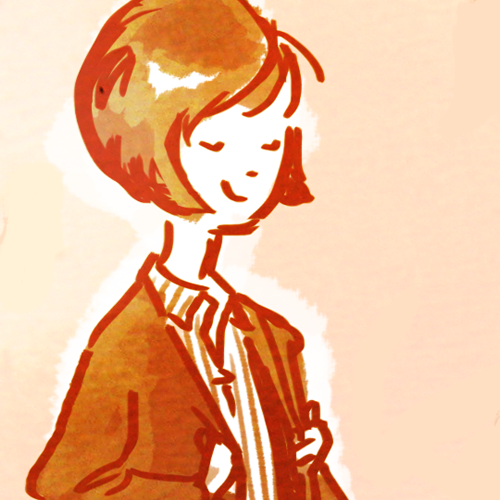 She has been the recipient of the both the Best Small Press Stumptown Award and Nerdlinger. Her longest auto-bio work, “Fugue,” is a three part story that traces the generational repetitions and relationship of her family utilizing music as a metaphor. 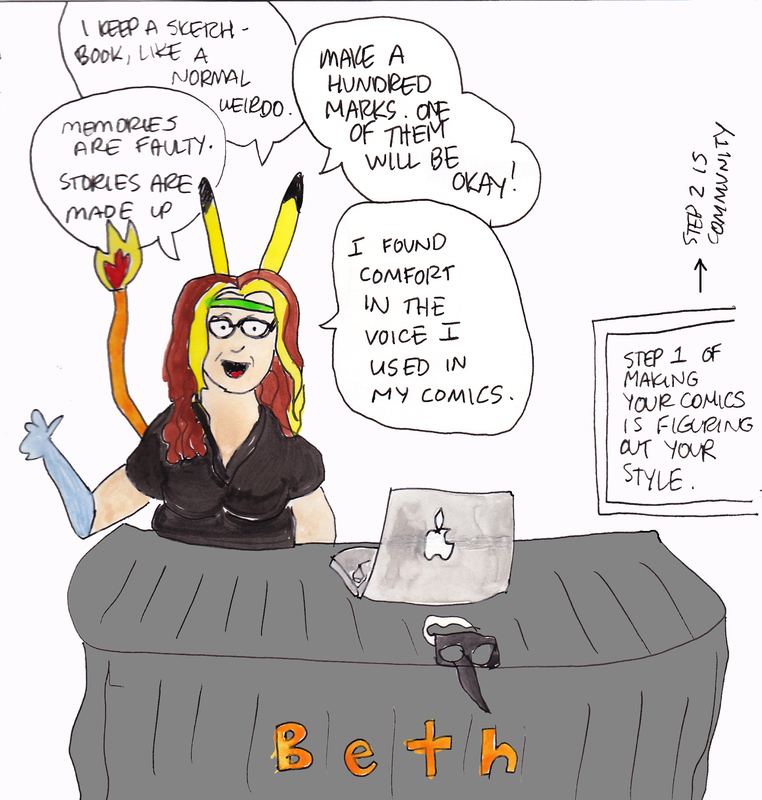 She frequently collaborates with her best friend, Kyle O’Connell, on fiction work–the current ideration of which is the first volume of their new series titled “Half Asleep.” For more about Beth and her work, visit her blog: www.beth-hetland.com. Our second speaker was Jaclyn Miller. 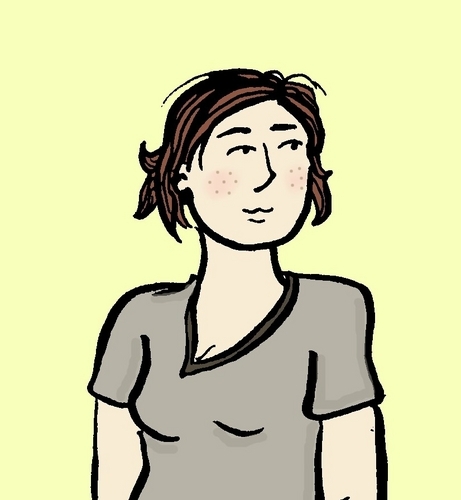 Her bio: Jaclyn Miller is a cartoonist living and working in Chicago. Her work deals primarily in autobiography, daydream, and memory. Her current project, “Rememberies,” is a minicomic series centered around childhood folly and reflection. 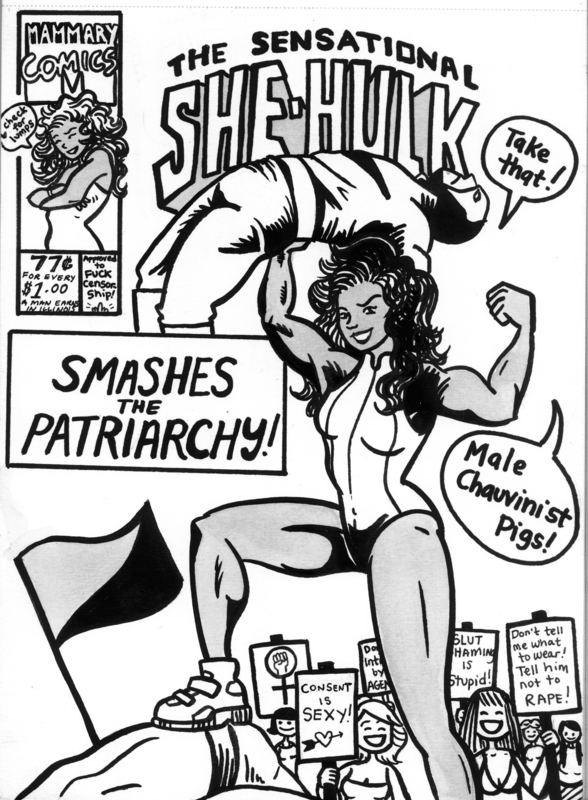 When she’s not working her day job or surrounding herself with good people and good comics, she spends her time as an organizer for the Chicago Zine Fest. Our September 2013 meeting took place on Thursday September 26, at 7pm. Our first guest was Rachel Foss. I was raised in the general area of (infamous) Flint, MI, where I watched a lot of Nickelodeon and read every Goosebumps book released prior to 1996.However, Flint sucked, so I left as soon as possible. I went to school and studied film and design. I graduated realizing that I didn’t really want to do either of those things. I moved to Grand Rapids and did nothing for a really long time. THEN in 2009, thanks to some amazing people, i discovered Comics/Graphic Novels/Cartooning. For many reasons, including this, I consider Grand Rapids, MI my true home. In 2011 I moved to White River Junction, VT (or more fondly TOON TOWN, VT) after I was accepted into the Center for Cartoon Studies Master’s Program.I now live in Chicago where everything is awesome, especially me. STRIPPED is a love-letter to comic strips. It brings together the world’s best cartoonists to talk about the art form they love, and what happens to it as newspapers die. Over 90 interviews were conducted, including the first-ever audio interview with Bill Watterson (Calvin & Hobbes)… Even more than comics, this movie’s about pursuing art in an age when the business of art is changing constantly. The film makers were on hand to discuss the project and answer questions from the audience! 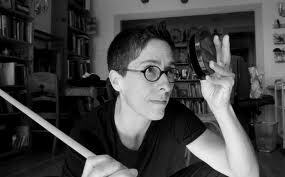 The Paper Mirror captures a pivotal collaboration between two influential lesbian artists, painter Riva Lehrer and graphic novelist Alison Bechdel (Dykes to Watch Out For, Fun Home, Are You My Mother.) They discuss beauty, disability, queer culture, and representation. 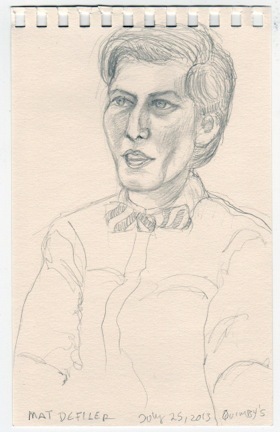 The film follows Riva Lehrer over the course of a year while she completes Alison Bechdel’s portrait — a process which springboards their careers into new and unexpected terrain. produced by Allen Schroeder, produced by Christopher Brown and Matt Mcusic. 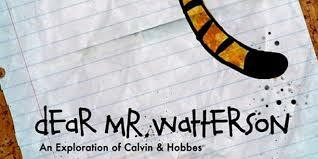 This film is not a quest to find Bill Watterson, or to invade his privacy. It is an exploration to discover why his ‘simple’ comic strip made such an impact on so many readers in the 80s and 90s, and why it still means so much to us today. WONDER WOMEN! THE UNTOLD STORY OF AMERICAN SUPERHEROINES traces the fascinating evolution and legacy of Wonder Woman. From the birth of the comic book superheroine in the 1940s to the blockbusters of today, WONDER WOMEN! looks at how popular representations of powerful women often reflect society’s anxieties about women’s liberation. WONDER WOMEN! 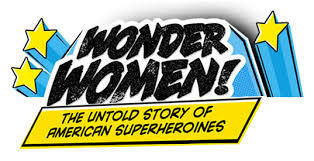 goes behind the scenes with Lynda Carter, Lindsay Wagner, comic writers and artists, and real-life superheroines such as Gloria Steinem, Kathleen Hanna and others, who offer an enlightening and entertaining counterpoint to the male-dominated superhero genre. Exciting announcement! Laydeez do Comics Chicago will be sponsoring a free screening of Wonder Women on November 14th at 1104 S. Wabash. More fanfare to follow. and finally… featured speaker Rachel Foss reports that there is a documentary about where she went to school to learn to make comics, The Center for Cartoon Studies. The film is called Cartoon College and is available on iTunes. 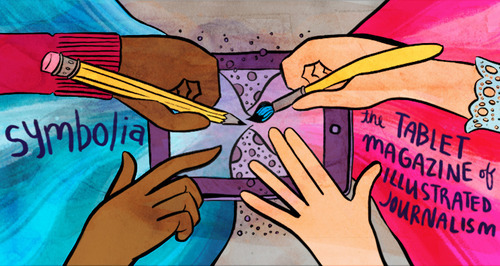 This month Laydeez do Comics Chicago focused on Comics Journalism. 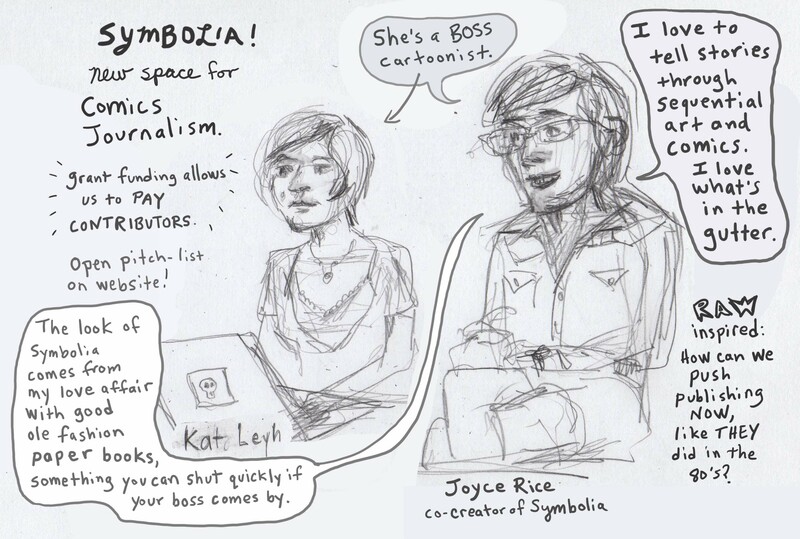 Our guests were Joyce Rice and Kat Leyh of the comics journalism tablet magazine Symbolia. Our visual scribe for the evening was Sharon Rosenzweig. You can listen to the meeting and see images on the video below. 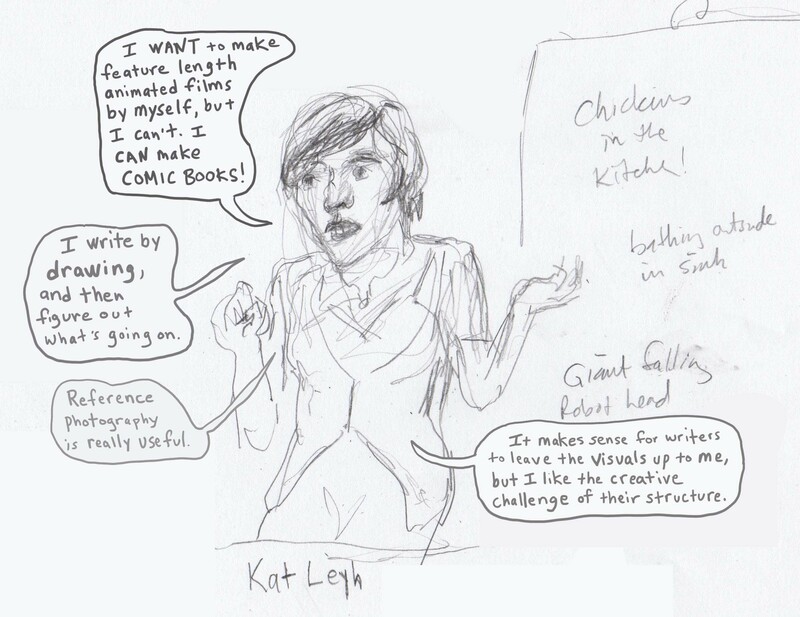 Our July meeting was held on Thursday the 25th and featured two Chicago based comics artists. 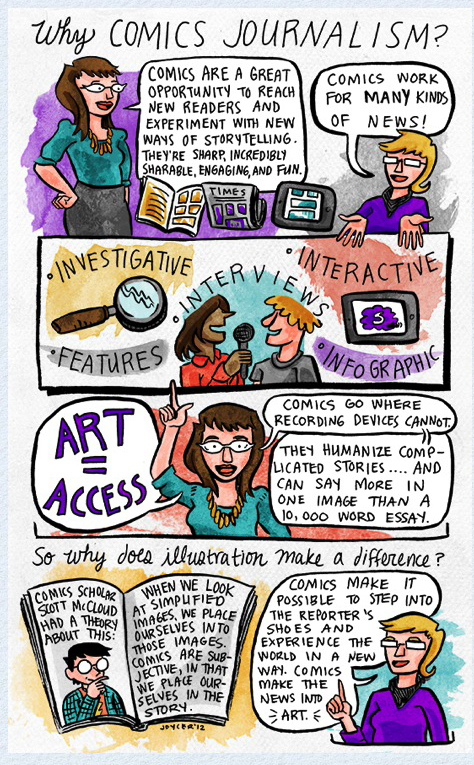 Our visual scribe for July was the fabulous Beth Hetland. Our first speaker was Gina Wynbrandt. She told us of her comics projects and her great love of Justin Beiber. Our second speaker was Mat DeFiler. Our presenters were also drawn by Riva Lehrer – official portrait artist in residence for the Chicago Humanities Festival in 2013. Our Special June CAKE edition meeting took place on Thursday June 13th, at 7pm. Two Seattle-based creators were featured. 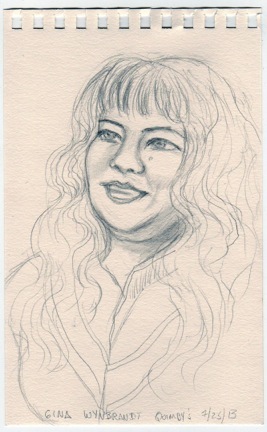 Cartoonist and academic Mita Mahato is an associate professor of English at University of Puget Sound. Her academic work often incorporates graphic novels, specifically those around illness. She is currently working on her own graphic novel in collage about grief and the loss of her mother. View her work in progress on her blog, These Frames Are Hiding Places. And our second guest was publisher Zan Christensen. LGBT comics writer and activist Charles “Zan” Christensen founded Northwest Press in 2010. It’s a book publisher dedicated to publishing the best lesbian, gay, bisexual and transgender comics collections and graphic novels and celebrating the LGBT comics community. He travels the country promoting and supporting his award winning creators.